For most of my life I have maintained that cats scare me. Not in a monster-under-your-bed sort of way, of course. I suppose it’s more of a healthy respect – like the one I have for heights. Every cat I’ve ever seen has a kind of quiet superiority. I’m pretty sure they’re smarter than me. They might, in fact, be aliens. Some days ago I was volunteering at the Jesup Memorial Library. I was on a step stool, pulling each book off the shelf and examining the slip in the back to see when it was last checked out. If it was before 2006, the book had to be weeded. Too many books in the Children’s Room! Down to the basement the unfortunate books went. 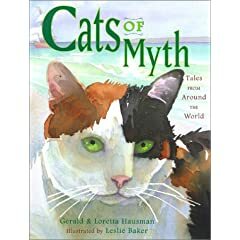 I was working through the nonfiction – 398’s, dewey decimal land of the fairy tales – when I pulled down Cats of Myth: Tales from Around the World by Gerald and Loretta Hausman. Well, what do you know, I thought to myself. Perhaps I’m not so far off after all. Home the book went, huge green eyes staring at me cleverly, even in an illustration. The book was intriguing. It was a collection of tales from ancient Egypt to the Middle East, to Europe, to Asia, to the Bahamian Islands. Everywhere, it seems, people have recognized that cats are creatures outside of the ordinary. Whether they be goddess, guardian, guide, trickster, warrior, rescuer, or magician, they have been and still are at humanity’s side, keeping an insightful eye on us all. They have kept evil troll kings at bay, defeated rats that even a master Japanese swordsman could not beat, ended wars without bloodshed, taught pirates like Calico Jack a lesson, and helped lonely fishermen win the love of princesses. And while the Whittle Cat of of Middle European myth may have tried to gobble up the world and everything in it – an under-your-bed-monster if I ever heard of one – cats in general are worth respecting. It’s probably not a bad thing to keep someone around who is wiser than you – keeps you humble. You never know. Someday that excellent mouser may give you a green stare, and start to speak. I would listen, if I were you, to what he or she had to say. Cats do talk! The question is do we listen? I do!